Zoë Sumra, The Wages of Sin. Elsewhen Press, 2017. Pp. 312. ISBN 978-1-91140-905-2. £9.99 pb/£2.99 e.
The Wages of Sin is the second novel by British SF author Zoë Sumra, published by the small speculative Elsewhen Press, a far future political thriller involving gangland turf wars on an ultra-violent, distant planet. While there is some genuine and well-sketched alienness in both the setting and the personae, much of the violence and organized crime in this novel are very familiar both from contemporary crime literature and indeed recent history. While the hallmarks of the small press sometimes show through in production quality, this is an enjoyable and largely effective magical space opera romp, which fully succeeds on its own terms. The protagonist of The Wages of Sin is the petty gangland boss Connor, a not terribly likeable leader who nonetheless clearly thinks of himself as the good guy—his moral position on his gangster role (albeit dictated by his powerful witch bodyguard) is “no drugs, no slaves, no whores,” and so instead he is an arms dealer, not one of the most moral professions in any world. Connor’s main motivation for action at the start of this novel is the murder of one of his cleaners, apparently an unusual concern from a crimelord for such a lowly servant, but when he thinks of this crime throughout the novel it is in terms of the insult and threat to him and his organization’s reputation, rather than about the girl as an individual worthy of sympathy. Other major characters in Connor’s circle include distant cousin Yasmine, maternity-cover for his spellweaver bodyguard, invincible and apparently unquestionably loyal. Another cousin, Atalanta, is a crack spy, also seemingly invincible. An unwelcome guest, his widowed aunt Gisele, is a social high-flyer, arch and insufferable, and ritually untouchable because of her recently bereaved status. Connor’s brother Logan, the husband of his usual bodyguard, is absent from most of the novel as the couple expect their child on another planet, although we see and hear about him a few times, and he feels as though he should be familiar to the reader as well as the protagonist. Finally Thakar, another trader on this lawless world, seems to be Connor’s occasional boyfriend. They are surrounded by other employees and henchmen, including a disturbing number of child-servants (notably Joshua, a ten year-old, unfeasibly proficient assassin). From a plot perspective, it feels a little odd that a small-time arms dealer should become so powerful a kingmaker as he does in the face of a planet-wide coup d’état. But then it also feels a bit odd that Connor has access to the apparently invincible spellweavers, child assassins, essential infotech, and all the rest, but his über-powerful enemies don’t. It may be that there are social and familiar reasons behind this otherwise inexplicable balance, but I feel I was missing some of the world background that could have made this clearer (on which more shortly). Was it Connor’s imagination that she stressed the ‘all’? 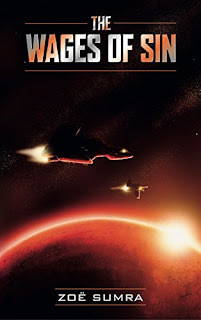 These admittedly fussy criticisms aside, when the pace picks up in the second half of the novel, The Wages of Sin becomes a violent political thriller full of intrigue, action, high-tech warfare, intergalactic shenanigans and world-shaking catastrophe. From here on the unravelling of the plot is gripping, and the reader (even one like me who didn’t care so much for Connor as a protagonist) becomes invested in the outcome, and genuinely believes in the sequence of events and decisions that lead to a satisfying dénouement. No doubt the adventure will continue in the ongoing Underside saga, a credit to the Elsewhen Press SF line.